Sony announces Ultra HD 4K streaming collaboration with Netflix | What Hi-Fi? Sony and Netflix are working together to help stream Ultra HD 4K TV content in 2014, including Breaking Bad and House Of Cards Season 2. 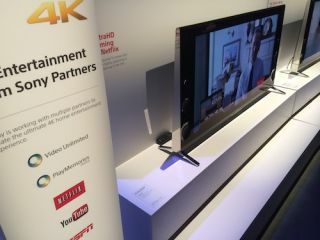 The hot news out of CES 2014 is that Sony and Netflix are working together to bring Ultra HD 4K streaming into the home. The two tech giants are looking to provide a streaming solution so you can enjoy shows such as Breaking Bad and series two of House Of Cards in Ultra HD 4K, during the first half of 2014. At Sony's CES press conference, Netflix discussed how Sony was using the new HEVC (High Efficiency Video Coding) coding to help create a more efficient streaming solution with Ultra HD 4K content. There's no word on pricing, when the UK will be ale to take advantage of this new partnership, or whether it's going to be exclusive to Sony. We've asked the questions and we'll be updating this story as we receive more news. Sony also announced it will be launching Video Unlimited 4K, an Ultra HD arm of its video download service which it claims will offer more than 140 movies in 4K. Again, exact launch dates and pricing are still tbc.